Charlottesville bed and breakfast travel guide for romantic, historic and adventure b&b's. 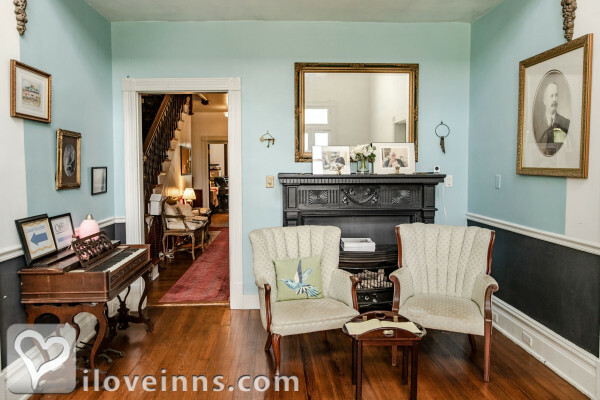 Browse through the iLoveInns.com database of Charlottesville, Virginia bed and breakfasts and country inns to find detailed listings that include room rates, special deals and area activities. You can click on the 'check rates and availability' button to contact the innkeeper. There is a lot to discover in picturesque Charlottesville, VA and Albemarle County. For the history buff, there is Thomas Jefferson's Monticello, James Monroe's Ashlawn-Highland, James Madison's Montpelier, and Michie Tavern. For the wine lover, there are numerous award-winning vineyards to tour and sample the incredible wines. Outdoor enthusiasts can enjoy activities such as hiking, horseback riding, hot air ballooning, and bird watching. Last but not least, there is the University of Virginia - renowned for its Rotunda, School of Medicine, School of Law, and the Darden Graduate School of Business Administration, not to mention its Cavaliers sports teams. By Foxfield Inn. Charlottesville is in the heart of Virginia with many historic sites such as Thomas Jefferson's home as well as James Madison's and James Monroe's homes. The University of Virginia, many fine wineries, Civil War battlefields and Appomattox, Va. where it all ended, are here in the area along with beautiful country drives such as Skyline Drive, and the Blue Ridge Parkway. By Prospect Hill Plantation Inn. Named after the queen consort of King George III, Charlottesville is a city in the state and commonwealth of Virginia. Charlottesville is the home of the University of Virginia and Monticello, both World Heritage Sites of the United Nations Educational, Scientific, and Cultural Organization. Monticello alone is visited by at least five hundred thousand people every year. Aside from these two, people visit Charlottesville because of its other attractions such as the relaxing Charlottesville bed and breakfast inns, its hiking trails, wine tours, and world-class entertainment. For recreation, visit nearby Shenandoah National Park with its breathtaking views of rolling mountains. For a more scenic view of the entire area, try driving Skyline Drive. The view that you will witness is simple breathtaking and you will experience the same with a different view on the Blue Ridge Parkway. By Dinsmore House Bed and Breakfast. Ahh... Charlottesville, Virginia. Make no mistake, this is Jefferson's town. Sure, Presidents Monroe and Madison lived here, and Lewis and Clark and Patrick Henry called this area home, as well... but Charlottesville is undeniably the reflection of one man... President Thomas Jefferson including writing the Declaration of Independence here. By Prospect Hill Plantation Inn. Explore and experience the many wonders and activities of the Blue Ridge Mountain Area of Virginia. Harmony Hill Bed & Breakfast is centrally located between Charlottesville and Lynchburg, in Nelson County. By Harmony Hill B&B. Charlottesville in Virginia manages to surprise its visitors with its many interesting sites. The number of attractions in town is amazing and Charlottesville bed and breakfast inns are found all over the city, providing visitors with very comfortable accommodations. Charlottesville boasts of famous wineries and great-tasting wines. One of the best ways to experience these is to take the Arcady Vineyard Private Wine Tours. Other prominent vineyards are Blenheim and Jefferson. Do not miss going to Monticello and taking pictures of this historic and beautiful president's home with beautiful historic architecture. This is only two miles away from Charlottesville. For more historic buildings, visit the University of Virginia campus, which is just a mile away. The Downtown Pedestrian Mall is the one place in Charlottesville where visitors can have a historic walk while shopping. By Prospect Hill Plantation Inn.